The artist merges material and metaphor. Detail of Victor Cohen Stuart's "Volcano." There are two kinds of people, goes an old joke: those who divide the world into two types of people and those who don't. Jorge Luis Borges wrote that everyone is a Platonist (idealist) or an Aristotelian (empiricist). Herman Melville, earlier, wryly compared the dangling severed heads of philosophical whales, Stoic (i.e., realist) and "Platonian." In art, there's the current dance-fight between modernist/pure-aesthetics formalists (art as music, as autonomous expression) and postmodernist/impure-aesthetics engaged artists (art as literature, sociology, or politics). The split between subjective and objective temperaments may be real, but it's not definitive; many artists fuse particulars with universals in arduously achieved syntheses. The abstract paintings of Victor Cohen Stuart, made from poured and dripped house paints à la Jackson Pollock mode, are exemplars of the non-objective formalism espoused by critic Clement Greenberg in the 1950s. 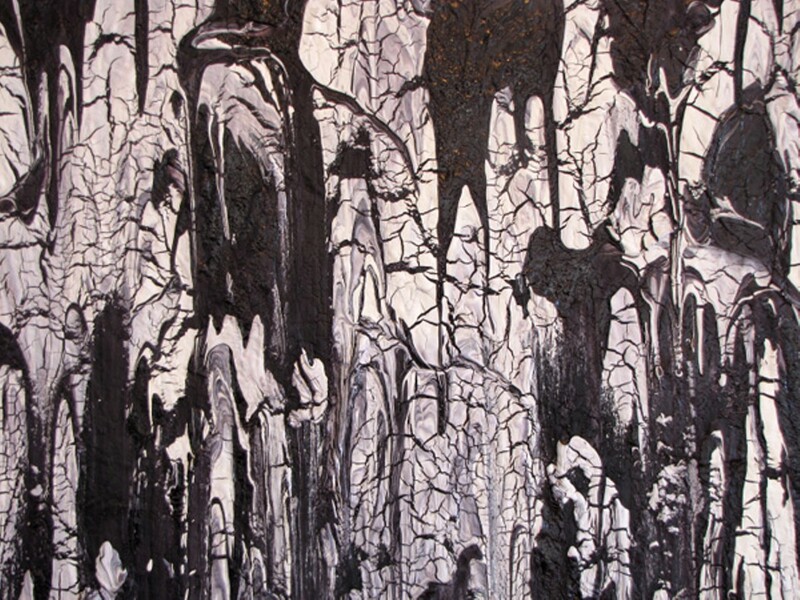 Yet, cracked and marbleized by the interplay of water-based latex and oil-based enamel, they evoke landscape, especially as codified in traditional Chinese ink painting, as well as "gothic architecture, triumphal marches, grand opera, and primeval forests," to quote gallerist Danielle Fox. She considers them "post-modernist Modernism at its best," a hybrid of pure and impure, inner and outer, fact and metaphor. Cohen Stuart, she continues, "plays in the gap between control and lack of control, and takes clear pleasure in dancing in the space between illusion and reality that is the sporting arena of most modernist art." Contradicting our insistent tendency to read space and illusion into the works are the three-inch-deep wooden supports (drawer-like shallow boxes, essentially) that assert their sculptural objecthood — and the fringe of frozen-melt paint stalactites lining the paintings — bottom edges.